Known for its vast deserts, snow-covered mountains, and scenic canyons, Utah has some of the world’s best white water on the Colorado and Green Rivers. Utah has over 100 navigable bodies of water including the largest salt lake in the western hemisphere. The Great Salt Lake, along with Utah Lake, Sevier Lake, Rush Lake, and Little Salt Lake, are remnants of ancient Lake Bonneville that covered much of western Utah during the last Ice Age. Bear Lake is called the Caribbean of the Rockies for its intense turquoise-blue color. The two largest reservoirs are Lake Powell and Flaming Gorge Reservoir. Approximately 2,740 square miles (about 3%) of Utah is covered by water. What is Utah’s maritime heritage? People have been using the fish, waterfowl, and game resources of Utah’s lakes and river valleys for about 12,000 years. The earliest were Paleo-Indians, followed by Desert Archaic people, followed by Fremont and Ancestral Puebloan people. By the 1770s when Spanish explorers entered Utah, the five major tribes that live in Utah today were there including the Ute, the Navajo, the Paiute, the Goshute, and the Shoshoni. American and French-Canadian fur trappers and explorers recorded and mapped Bear Lake, the Great Salt Lake, and the Green River during the first half of the 19th century. A trading post was established in Bear Lake Valley in the 1840s, and Mormon settlers began arriving in Salt Lake City in 1847. John Wesley Powell led expeditions down the Green and Colorado Rivers in the 1860s and 1870s. Initially, unpowered barges, rowboats, and skiffs were used to float the rivers and ferry passengers and freight. 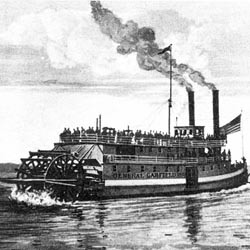 One of Utah’s first steamboats was launched in 1868 to carry railroad ties and telegraph poles across the Great Salt Lake to help build the transcontinental railroad. Attempts were made to establish riverboat service with powered craft on the Green River between the towns of Green River, Utah, and Moab, Utah, beginning in the 1890s, with limited success by the 1920s. Today, Utah’s lakes and rivers are popular tourist destinations for river running, boating, and fishing. The ruins of many prehistoric and historic sites and towns became inundated when the reservoirs in Utah were filled with water. This includes about 50 prehistoric Ancestral Puebloan sites in Lake and Moqui Canyons now covered by the waters of Lake Powell, and the townsite of Linwood, founded in the 1890s, at the bottom of Flaming Gorge Reservoir. 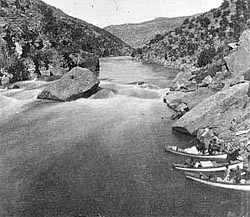 Historically, a number of riverboats were lost on the Green, Colorado, and San Juan Rivers in Utah. Other boats were damaged or unsuccessful in hauling passengers and freight and abandoned by their owners. Four examples are the steamers Major Powell, abandoned in 1894; the Undine, lost in an accident in 1902; the General Garfield, destroyed by fire in 1904; and the Wilmont, damaged by winter ice and abandoned in 1908.
Who takes care of Utah's underwater archeological sites? The Federal Government takes care of many archeological sites in Utah because it manages over 64% of the land in the state. The primary federal land managing agencies in Utah are the Bureau of Land Management, the Forest Service, the Department of Defense, the National Park Service, and the Fish and Wildlife Service. About 4% of the land in Utah is within Indian reservations, and 22% is privately owned. The remaining 10% of the land, including the beds of natural lakes, is owned by the state of Utah. The Division of State History in the Utah Department of Community and Culture studies, preserves, protects, and shares information with the public about the state’s antiquities, historic and prehistoric ruins, and historic sites, buildings, and objects. The Division accomplishes its mission through its State Historic Preservation Office and its Antiquities Section. You need an archeological permit from the Governor’s Public Lands Policy Coordination Office to conduct surveys and excavations of archeological and anthropological sites on state lands. You need a Permit for Archeological Investigations from the appropriate federal agency when the site is on federally owned or controlled land. Permits are issued to qualified individuals and collections must be deposited at designated museums, curation facilities or repositories. What laws concern underwater archeology in Utah? Utah’s laws relating to its archeological sites are set forth in several Titles in the Utah Code. The primary authorities are in Chapter 8 of Title 9 including Part 3 that covers Antiquities and Part 4 that covers Historic Sites. Within Title 76, Cultural Sites Protection is covered in Part 9 of Chapter 6, and Miscellaneous Provisions relating to human remains are in Section 704 of Part 7 in Chapter 9. 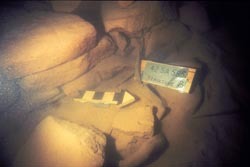 Many federal laws provide authorities for protecting and managing archeological sites. Some of these apply government-wide while others are agency-specific and apply to particular lands or resource types. A list of laws and other authorities is posted on the History and Culture page of the National Park Service’s website.